My placement year as a Digital Marketing Assistant at GlowMetrics has now sadly come to an end, so I’ve written a short blog on my time here. I started my placement with a keen interest in the area of marketing, but although I had no prior experience or knowledge on digital marketing, I am leaving and returning to university with a wide knowledge of all things digital marketing! Firstly, I would just like to say to anybody reading this who’s thinking of undertaking a placement year, or anyone who knows someone that is thinking about it; definitely take one because you will gain so much practical experience and skills which will help you after university! Before I started at GlowMetrics, I knew how important digital technology and the internet was, but I had no idea just how influential the internet can be for businesses. By using PPC, SEO, Google Analytics and Social Media Marketing, it’s been good to see just how each method of marketing helps businesses get their presence online. As I mentioned before, I started my placement with no knowledge or experience on digital marketing or Google AdWords. I soon came to realise how crucial it is, as it’s a very effective way to help attract and retain online customers. It’s been great to see the return that businesses get on their investment into Google AdWords. By using analytics, you can track the results from campaigns, seeing the traffic and conversions. I’ve been lucky to manage some large PPC budgets for multiple clients and optimise their digital marketing techniques to help increase the ROI and click-through-rates, as well as setting up online marketing campaigns including paid search, display and social for different clients. AdWords has huge advantages for businesses with Analytics helping them understand their consumer and the steps they take on their websites. With website users, it creates a better user experience by helping them find exactly what they are looking for. Search Engine Optimisation (SEO) is a marketing discipline focused on growing visibility in organic (non-paid) search engine results and is becoming increasingly more important for businesses. If your website isn’t appearing in the first couple of pages, your customers or potential customers won’t be able to find you. Users trust search engines, and having a presence in the top positions for the keywords the user is searching will increase the website’s trust. The world of SEO can be complex, but most people can easily understand the basics. Even a small amount of knowledge can make a big difference. SEO can put you ahead of the competition; if two websites are selling the same product or service, the optimised web page is more likely to gain customers and therefore generate more conversions. Simple SEO tasks like writing metadata and quality link building are ways I’ve learnt to positively affect your business. Undertaking a placement year has allowed me to meet some great people and work with the nicest clients! Getting practical experience in a digital marketing role has allowed me to learn so much that I never knew before I started. 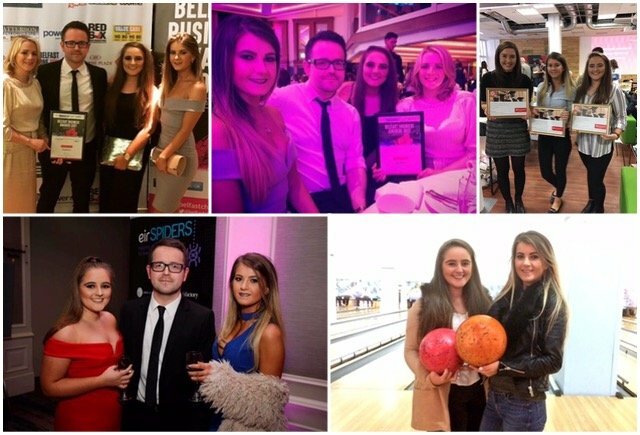 I’ve attended some great business events including Digital DNA, eirSpider Awards in Dublin, Belfast Business Awards and MeasureBowling. My most memorable moment would have to be at the eirSpiders in 2016 when our name got called out as the winners of ‘Best Use of Data and Web Analytics’ category for our work with Barnardos! I must admit, it was nerve-racking walking up on stage in front of all the business professionals, but it was a massive achievement for GlowMetrics and will help the business to grow in the future! I’ve had a fantastic year at GlowMetrics, and I’m going back to university with a strong passion for digital marketing – I have now realised that marketing is the job for me in the future!